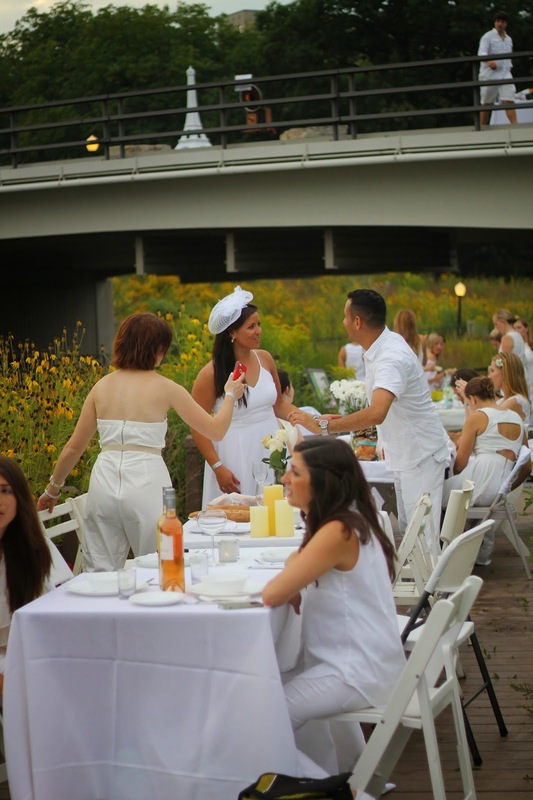 Last Thursday evening I had the absolute pleasure of attending Chicago's 3rd Diner en Blanc. I don't consider myself to be the most poetic writer so I'm going to rely heavily on the pictures in this post to do the talking. And if that is not enough, I dare you to watch this video and not get excited to participate next year. 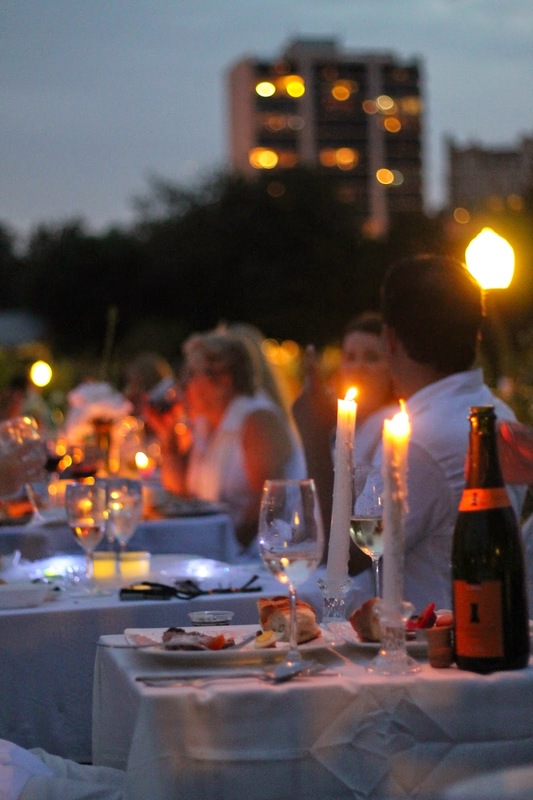 Diner en Blanc was started over 25 years ago in Paris by a man Named Francois Pasquier with just a few of his friends, and has now turned into a magical night of food and friends all over the world! It takes place in about 40 cities and in some of the most beautiful locations at historical landmarks all around. The concept is genius. Thousands of people eagerly wait to find out the secret location of the party until minutes before it begins. 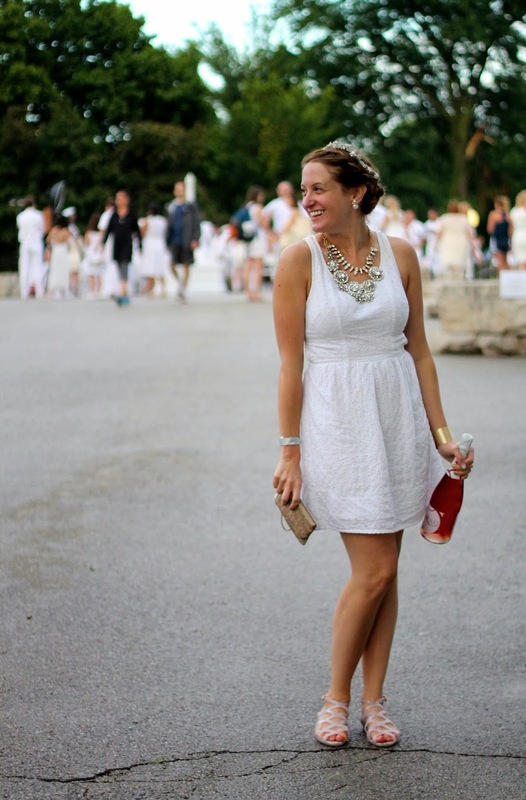 After the location is disclosed, participants come dressed entirely in white with all their supplies in hand. To maintain the integrity and elegance of the event there are many rules and guidelines guests must follow. All the planning and preparation is worthwhile in the end because what unfolds is pure magic. The night started out with a huge rainstorm that thankfully died down as we arrived at our meeting place on the beach. We still had no clue where we would be going! After checking in with table leaders we began our epic parade over to the secret location. We finally arrived at the Lincoln Park Zoo Nature Walk filled with beautiful flowers and endless walkways and a sea of excited ladies and gentlemen. 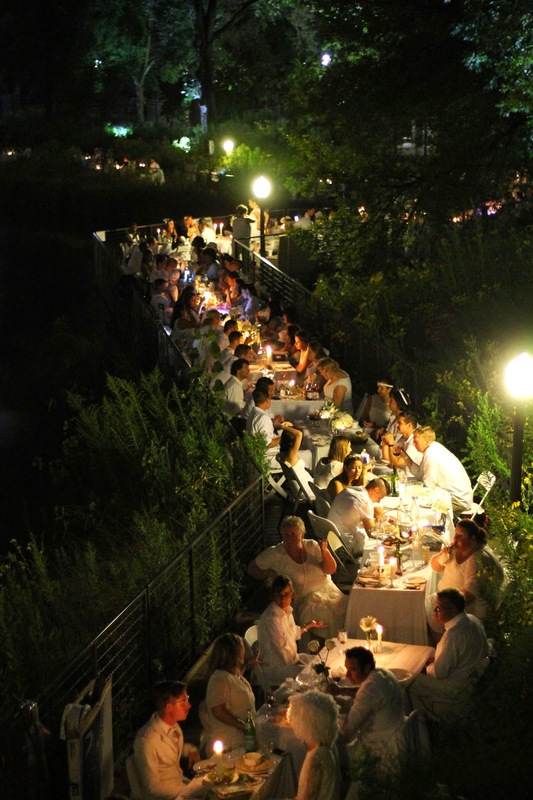 Guests began to show up in large groups to set up their tables and chairs, all decked out in white of course. Before we knew it, there were tables on every walkway all around. Our table was complete with white candle holders spray painted by Amy, and the last bunch of white roses I could find in the city thanks to Marianos! 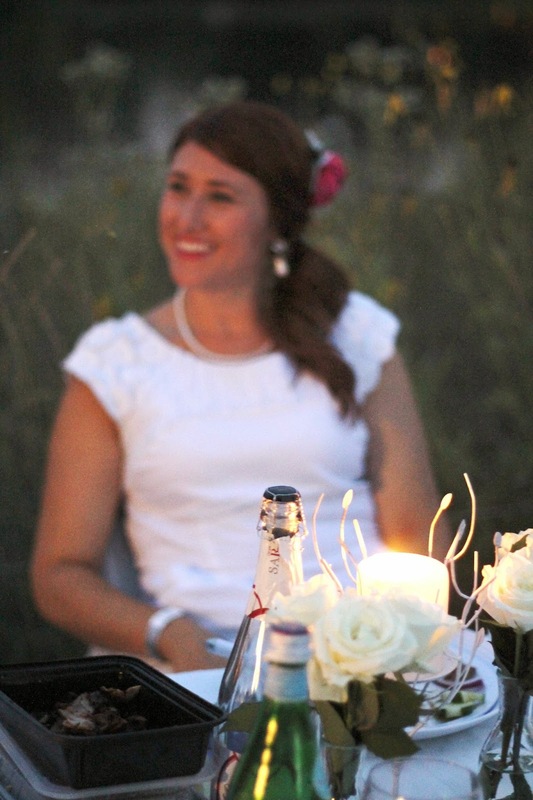 Amy wore lots of sparkles, her new favorite earrings, and even spray painted a tiny floral crown that was the perfect touch for this elegant evening. 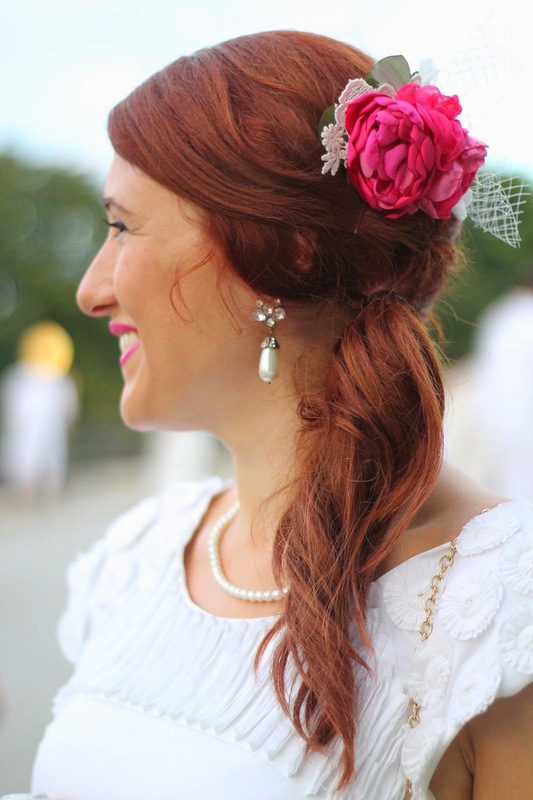 I made sure to represent my signature color by wearing this pink floral hair comb with a bit of white netting and hot pink lips. 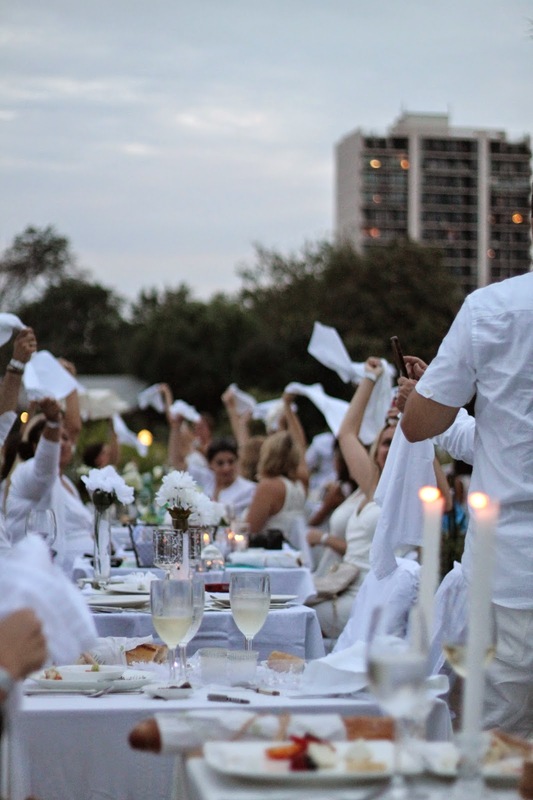 As the rules dictate, once all guests are seated and prepared, everyone spins their white linens above their heads to signal the beginning of the meal. The magic of the evening begins as the sun sets and while enjoying our meal which I picked up from Greek Island and desert from Artopolis, we begin to make new friends all around us as we soak in the beauty of this unique experience all around us. 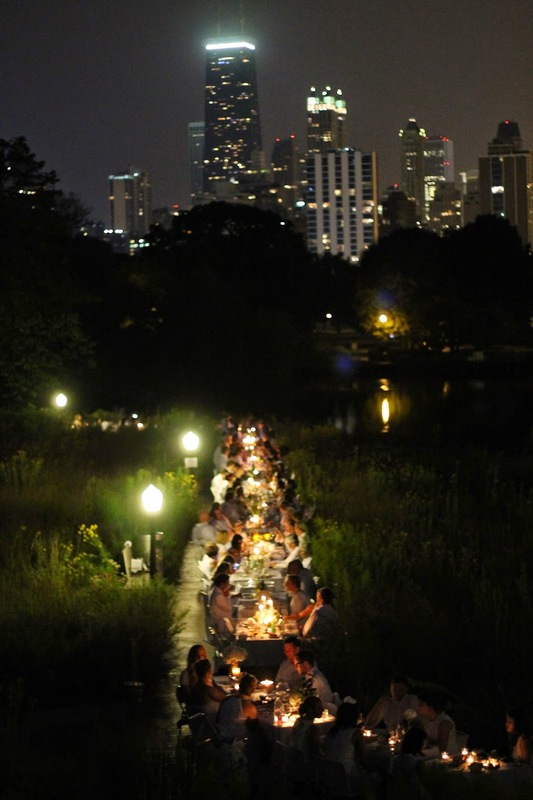 After dinner wraps up, guests light up sparklers together which makes for a pretty gorgeous view all around. It's pretty amazing to see the thousands of guests all around as far as the eye can see all lit up. So much beauty to take in all around. After dinner, there was dancing up on the bridge. Such a gorgeous backdrop and amazing time. Truly unforgettable. So, who's with me for next year? This looks like the coolest event! How hard was it to find tables, chairs, etc? And then lugging everything over to Lincoln park? This is so up my alley!! Hope I get promoted to the big girl list from the waiting list in time for next year! I'm in! This looks magical!